Well, the pleasant summery conditions from our first Regional of 2018 didn’t last long. The fleet well and truly took a hammering off Howth for the Leinsters, with 20-25kts and a very nasty chop for most of the weekend. 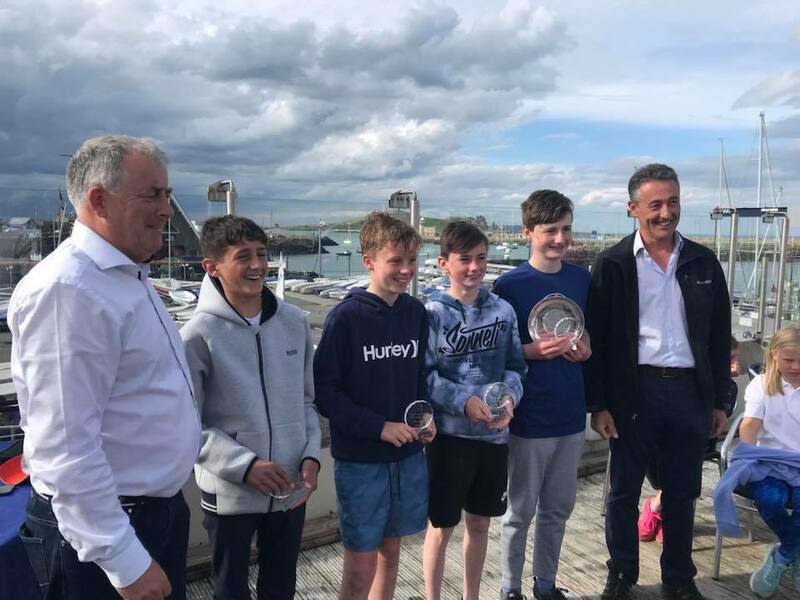 However, conditions seemed to suit the Royal Cork sailors – taking Senior Fleet, Junior Fleet and the VP Trophy which was sailed on the Friday! We had two teams represent us at the VP Trophy. 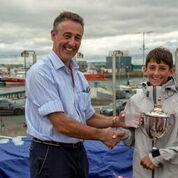 The VP Trophy is essentially the Optimist National Team-Racing championship, and the Royal Cork headed into the 2018 event with a run of 3 straight wins. 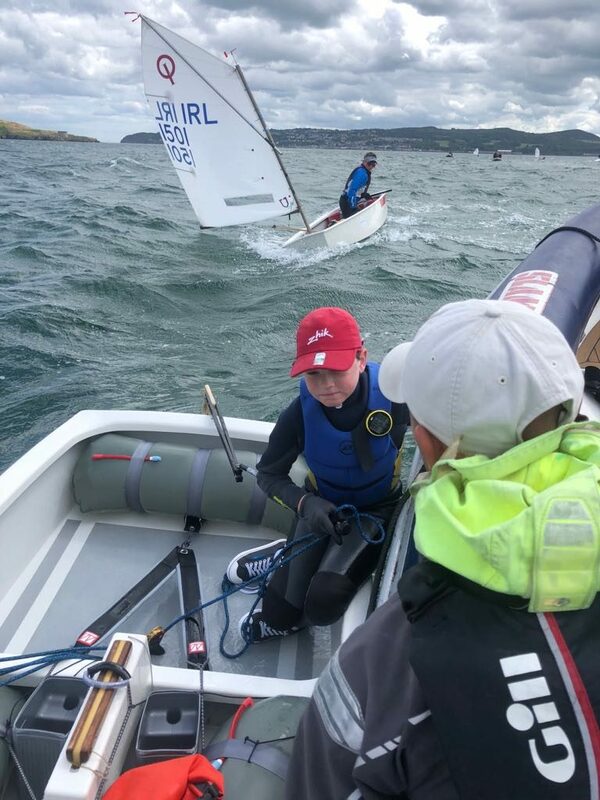 Making that a 4th in a row was the job of RCYC 1, Harry Twomey, Michael Crosbie, James Dwyer Matthews and Justin Lucas and RCYC 2, Patrick Bruen, George Pritchard, Ben O’Shaughnessy and Alana Twomey. Both teams sailed very well throughout a highly competitive round robin with 12 teams in total, and made it into the semi finals. RCYC 2 acquitted themselves very well and finished 4th overall, and RCYC 1 overcame a few close calls to take the win and secure the VP for the 4th year running. Well done to all. Saturday brought the Leinsters, and with it a strong Westerly breeze. The race area was west of Ireland’s Eye, where the breeze had a fairly uninterrupted run over low, flat land. The short chop, with some wind over tide, meant the seas were very challenging for square-bowed optimists. The Junior Fleet fell victim to the conditions, only securing 2 races – but they caught up on the Sunday. 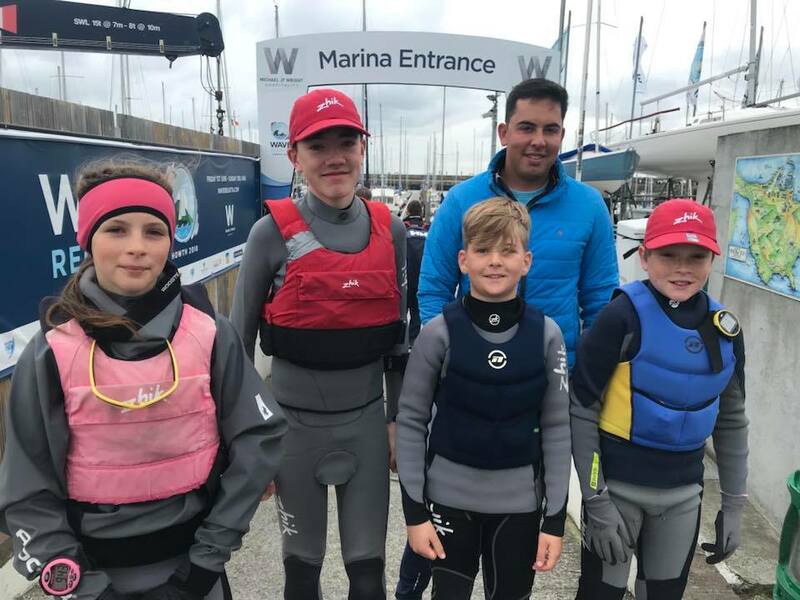 Early forecasts showed a lighter day Sunday, and despite the Southerly direction being in theory more sheltered, sea & wind conditions were similarly challenging as it turned out, apart from a 20 minute lull in the final Junior race. 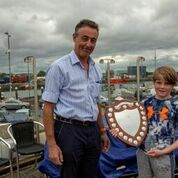 Maybe the Regatta Fleet sailors are better at reading forecasts, as there was only 18 in total and just 2 from the Royal Cork, and they only managed 2 races on Saturday. Well done to Lucy Moynan and Fionn Hayes – a tough weekend to debut on the circuit! Junior Fleet went to the wire – and beyond. Many of us had left for home thinking the results were settled having gone right to the last 100 metres on the racecourse and a tie broken on the last race; but it was not the case – a late adjustment gave Ben O’Shaughnessy an extra place and with it the Junior title. A great result for Ben who had to fight right to the end for the win – showing why you never give up! Alana Twomey suffered a BFD (along with about 16 others in Race 4) and came 4th, again on countback. Emmet Lucas was 8th, narrowly ahead of George Pritchard in 9th place. Rian Collins had a good day out, finishing 16th, with Harry Moynan our best placed Silver Fleet sailor in 19th. Harry beat David McSweeney by 1 point, another one using his discard on a BFD! Ellen Bruen did really well in the conditions finishing 33rd, and Charlie Venner finishing tied for 46th with a number of the fleet. Justin Lucas took another great win in Seniors, counting only firsts and thirds in his scoring for the weekend. Michael Crosbie pushed him hard, and was only one point behind into the last race, but did enough to keep that second spot. The next Royal Cork sailor was James Dwyer Matthews in 8th place. Richard McSweeney had two great races with top ten finishes on the Saturday, closing out his regatta in 17th overall. Harry Twomey finished 19th having to count a second OCS in his scores. Patrick Bruen was next Royal Cork sailor in 23rd, two places ahead of James Murphy who sailed very consistently. James lead home a bunch of club sailors, with George O’Keeffe in 26th, Simon Pritchard in 27th and Anna Keal in 28th. Liam Duggan again did very well and showed great determination and grit in the conditions, grinding out a number of finishes and coming in 46th. Thanks to Derek and Siobhan for towing the club trailer up and back respectively. The McLaren Award for the fastest pitstop of the weekend went to Peter, Michal and Derek who changed out a rudder in less than 2.4 seconds (or so the story went in the bar) to make sure one of our sailors made their race!